This set of Microwave Engineering Questions and Answers for Freshers focuses on “Surface Waves on Grounded Di-electric Sheet”. 1. Surface waves are typical by a field that decays ______away from the dielectric surface, with most of the field contained in or near the dielectric. Explanation: Surface waves are typified by a field that decays exponentially away from the dielectric surface, with most of the field contained in or near the dielectric. At higher frequencies, the field generally becomes more tightly bound to the dielectric, making such waveguides practical. Explanation: The fields are stronger and concentrated near the dielectric, and hence because of the presence of the dielectric, the phase velocity of a surface wave is lesser than that in vacuum. Explanation: The equation describes the variation of the electric field along the direction of propagation that is the Z direction. In the equation, it is clear that the relative permittivity of the dielectric is also a part of the second term of the equation. Explanation: Cutoff wave number signifies the minimum threshold wave number required for propagation. Here the expression kC2= ∈rk02-β2 gives the cutoff wave number for the propagation of waves on a grounded dielectric sheet. Explanation: Grounded dielectric sheets allow TM mode of propagation on them. The cut off frequency for the propagation of TM mode is given by the expression fC = nC/2d√(ϵr-1). Explanation: The expression for cutoff frequency for wave propagation in TMn mode is fC = nC/2d√(ϵr-1).here n represents the mode. Substituting the given values, cutoff frequency is 5.92 GHz. Explanation: Grounded dielectric sheets allow TE mode of propagation on them. The cut off frequency for the propagation of TM mode is given by the expression (2n-1)c/4d√εr -1 . 9. What is the cutoff frequency of TE₁ mode of propagation if the relative permittivity of the slab is 3.2 and the thickness of the slab is 45 mm? Explanation: The expression for cutoff frequency for wave propagation in TEN mode is (2n-1)c/4d√(εr -1). substituting the given values in the above expression, the cutoff frequency for TE₁ mode of propagation is 1.12 GHz. Explanation: Since for TMO mode of propagation on a dielectric sheet the cutoff frequency is 0, it is not practically possible for propagation. Hence, TM1 mode is the first propagating mode. 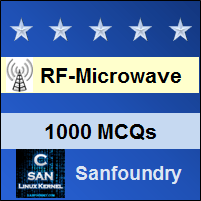 To practice all areas of Microwave Engineering for Freshers, here is complete set of 1000+ Multiple Choice Questions and Answers.